There are two main categories of butterfly valves: resilient seated and high performance. Resilient seated valves typically have ductile iron bodies and lower working pressures and temperature ranges. High performance butterfly valves provide carbon or stainless steel bodies with teflon seats and have higher pressure and temperature ratings. Butterfly valves are used for on-off (fully open, fully closed) service, or control (modulating) service. The types of operators available to open and close the valve range from simple lever handles, to wheel-driven manual gear operators, to sophisticated pneumatic, electric and hydraulic actuators. Butterfly valves offer a simple design with few moving parts, thus making them easy to service and maintain. The valve consists of just four primary components: the body, the stem, the disk and the seat. 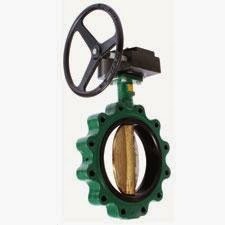 The body of the valve is provided in two mounting styles - lug and wafer. A lug body valve has cast-in lugs with bolt hole patterns matching pipe flanges. A wafer body valve does not offer the mounting hole pattern and is sandwiched between the two pipe flanges, with the bolts surrounding the valve body. Wafer style bodies are less expensive. Lug body valves can be used for dead-end service or allow for down stream pipe service. The stem is a one or two piece shaft that holds the disk in place and provides the rotational torque that opens and closes the disk. On resilient seated valves, the stem is isolated from the process media by packing rings and allows for a more economical way to manage the valves application to different potentially corrosive media. High performance butterfly valve stems come in contact with the process media and must be compatible with the media to provide proper performance. The disk is the part of the valve that is fully in contact with the process media and controls flow. Disks come in many materials and can be coated with corrosion resistant polymers. Some butterfly valves have unique contoured disks which are specially aligned with the stem to improve flow control, change the torque requirements or provide longer life for the valve. The seat is the soft material (elastomer of polymer) the disk comes in contact with for valve closure. A resilient seated valve uses an “interference fit” for closing, meaning the disk is pushed into the seat. Shutoff is accomplished by the disks edge and the resilient material. High performance butterfly seats also utilize a interference fit, but with much tighter tolerances. 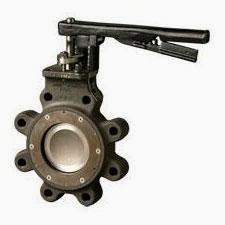 High performance butterfly valves are also assisted by the upstream pressure to assure tight seating. The most common materials for HPBV seats are PTFE or RTFE. Resilient seated valves offer many different materials for seat selection, such as Buna-N and Nitrile, and should be specified based upon the process media involved. For higher pressure and higher temperature applications, metal seats are available for high performance butterfly valves. If you have any questions about the application of resilient seated or high performance butterfly valves, it is strongly recommended you contact an expert to assure the proper application.